Business Transformation: It’s Like H Day All Over Again. All it takes is years of prep and 10 minutes of organized chaos. Maria Black, President, ADP Small Business Solutions and Human Resources Outsourcing @ADPTotalSource #PEO #HCM #hellowork — Love family, history & skiing. Kungsgatan, Stockholm, on Dagen H Day. Throughout my childhood, my father told many stories about Dagen H (H Day) in Sweden. He spoke of decades of resistance to the idea, votes to stop it, and elections of officials who vowed to block its implementation. There were years of infrastructure design, preparation and marketing campaigns. That’s because Dagen H — September 3, 1967 — was the day Sweden switched from driving on the left side of the road to driving on the right side. The “H” stands for “Högertrafik,” the Swedish word for “right traffic.” But make no mistake, it was a transformative day. Transformation is tough. In order to create progress or conform to competitive pressures, the hand of change sometimes has to be forceful. We see this every day as technology evolves and innovation speeds the pace of life. In the case of H Day, all of the bordering Scandinavian countries had already implemented right-hand traffic, decades before Sweden. As a result, most Swedish vehicles had left-hand driver’s-side steering wheels, creating a proven higher accident volume due to poor visibility. While switching to the right side of the road seems logical for Sweden today, it took years to ultimately accomplish the transformation. Referendum after referendum was voted down as the public protested the change. Cost was a huge deterrent as every bus, bus stop, traffic light, and traffic sign, had to be re-engineered, if not replaced. In fact, more than 1,000 new buses were purchased with doors on the right-hand side and approximately 8,000 older buses were retrofitted to provide doors on both sides. In some ways, Sweden’s transformation reminds me of running a business. We all have constituents — clients and associates — who are impacted by technological and market transformations every day. The market and client expectations are clear: We must transform our solutions, our processes, and our response times to accommodate those dynamics. Clients today expect more integration, faster resolution, and less service incidents. These are all obvious goals, but they nonetheless present a challenge to be managed. A key ingredient to significant transformation is change management. Granted that term is overused, but overuse doesn’t diminish its power. H Day is good example of how extensive a change management effort can be. Years prior to that day, a comprehensive education campaign swept the country. It described the rationale behind driving on the right; showcased marketing materials, including logos and flyers, and even had its own theme song! Driving tips were distributed and, once the day arrived, Swedish authorities wore one red and one green glove to help remind drivers which side of the road was the correct side. The official Dagen H logo. It all came together in 10 minutes of organized chaos. And as traffic stopped at 4:50 a.m. on September 3, 1967, and restarted at 5:00 a.m., the country was prepared. In that 10 minutes, it became safer to drive across the Scandinavian borders. This was a big deal. 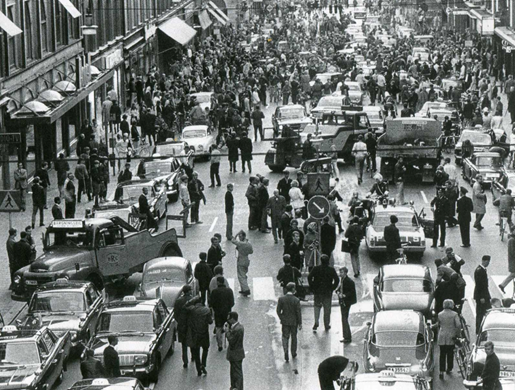 Five million vehicles crossed those borders annually and approximately 90 percent of Swedes drove on the left-hand side of the road. This led to many head-on collisions as cars tried to pass each other on narrow two-lane highways. Over time, accident rates dropped. The change was embraced. Life went on. Mission accomplished. 1. Redirect resistance. Change is hard. That said, changing times also offer us opportunities to push ourselves into uncomfortable situations. That’s how we grow. As a leader, find ways to help people embrace the change that their natural instincts may tell them to resist. 2. Plan the work and work the plan. Preparation and perseverance is everything. Having a plan is only useful if you — and a larger team — have confidence to implement it. 3. Provide tools. The key to success is using clear maps of the business strategy and tangible approaches of how to get from here to there. Teams often can see the directions for themselves; when they can’t, offer gentle hints to help them find the way. 4. Communicate. Don’t underestimate the power of simple, consistent methods of informing employees. Hand out flyers, leverage social media, and shout it from the roof tops — then, repeat! Of course, always allow for feedback back to you…that will reaffirm the path you’re on or give you early insights on when it’s time to adjust. 5. Expect chaos. In fact, embrace it. Just ensure it’s organized. And learn from each incident to minimize future unexpected detours. 6. Provide a system for feedback and measurement. Be clear why the transformation is under way and what the goals are for its implementation. Then, measure the results. You can’t improve what you don’t measure. Plus, your team will appreciate the success is not just a “gut reaction” on your part! 7. Focus on continuous improvement. Interestingly, by 1969 accident rates returned to what they were prior to the change in Sweden. In light of that, I’d offer that innovation and transformation are not static events, but a series of (perhaps daily) commitments to driving results and improvement. The fear of regression reinforces the need to measure — consistently — to ensure the goals and improvements continue to accelerate. Transformation is a necessary — albeit, sometimes painful — component of every business’s growth. It’s sometimes tough to get there, but it’s attainable — especially when we all try to drive on the same side of the road!